1) Caseload Manager is able to accommodate a variety of languages. To change to a Western language (French, Spanish, etc. ), simply type in the new Field header and begin typing in your desired language. 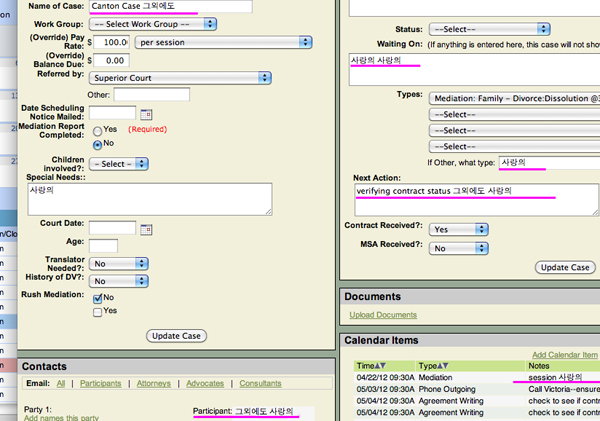 2) You may also use Caseload Manager with Non-Western Characters, for Mandarin, Japanese, Korean, etc. The majority of the fields may be switched. However, date will still need to be in the American time format (mm/dd/yyyy) in order for the dates to sort correctly. We are currently developing Caseload Managers in French and Spanish.